Lengko rice is Javanese rice (Cirebon) serve with fried tofu and tempeh, cucumber, beansprout, and a big dollop of peanut sauce. 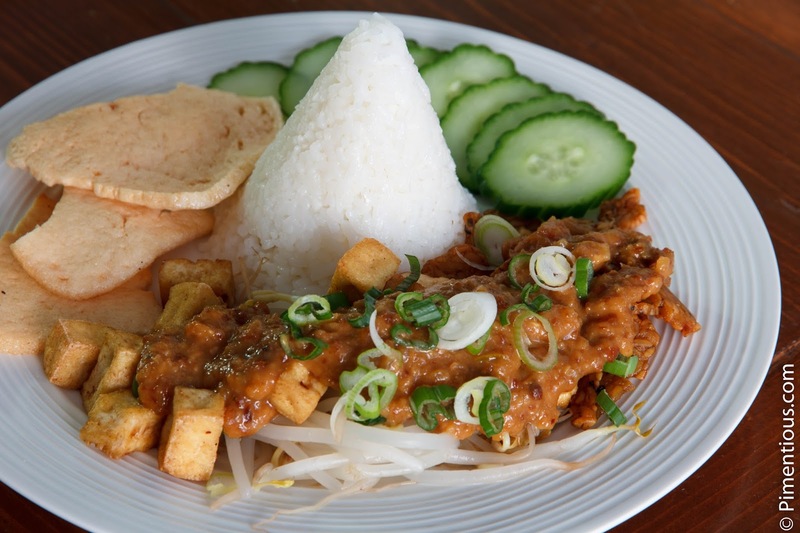 Indonesian food uses peanut sauce often as salad dressing (Gado-gado, lotek, Pecel, etc). In my case, I am a peanut sauce fanatics, I even eat my dumplings with peanut sauce. There are three things that I eat with any rice meal whenever possible: peanut sauce, Ketjap Manis, and shrimp crackers. Those stuff are my holy trinity. 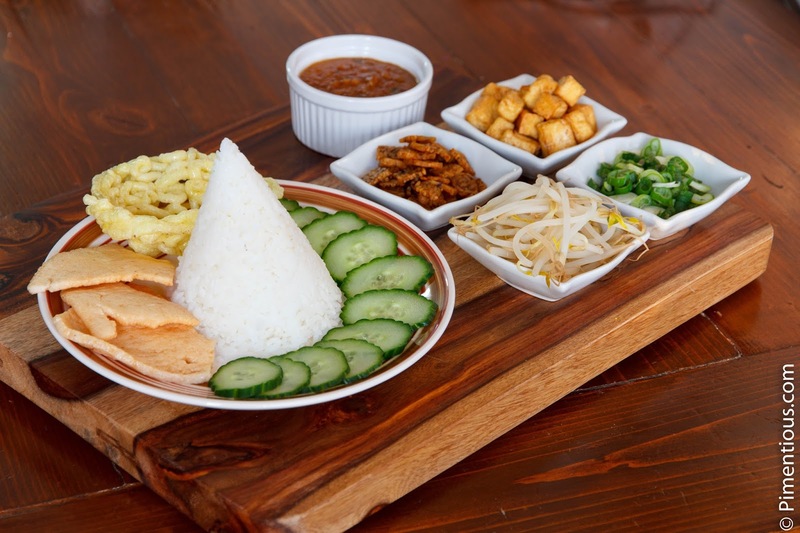 Okay, back to the awesome Nasi Lengko. This dish is very simple and can be prepared in an instant. The signature flavor of this dish I must say comes from the Kaempferia Galangal (kencur). Some recipes mix the peanut sauce with coconut milk, but I prefer not to. I find it too much in flavor. Plus, if I make a big batch of peanut sauce, it can not be kept too long since the coconut milk will get spoilt easily. 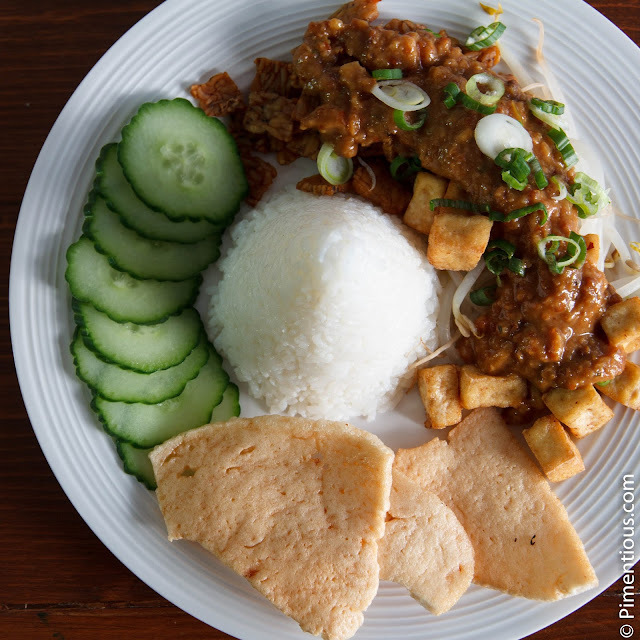 Fry the tofu and tempeh until it turns golden and the tempeh becomes crunchy on the outside. Now lets start the peanut sauce! Add water to dilute the mixture and keep it in an airtight container until serving time. Now we are ready to plate! Drizzle Kecap manis on the peanut sauce (if you like). If you want it to be perfect, have a glass of black tea aside too! PS: Some people serve their Nasi Lengko by mixing all the ingredients all together, even the rice. It looks a bit messy, but it does make all the flavor mixed together.